I had my jaw sewn back on before she could turn around to see it hanging completely agape. I’ll give her the benefit of the doubt and posit that it was a throw-away line, perhaps not what she really meant, or the result of a stressful morning. But in the event that others who may stumble upon this blog share the sentiment, or perhaps think of Memorial Day more along the lines of what goes on the grill or the eternal Bud versus Miller Lite quandary, I’d like to clarify what today is about. If we’ve done it right, the graves of US soldiers who have died in the course of their duty to our country will be decorated with flags today. Beneath each of those flags lies a life story as important as your own. This person went to sleep and noticed whether the sheets were scratchy or not. They hated hangnails and had a favorite color. They came from all kinds of families, and each of them hoped to be all the good things their parents were and none of the bad. The soldier buried there occasionally got songs stuck in their head and was most likely in love when their life was cut short. 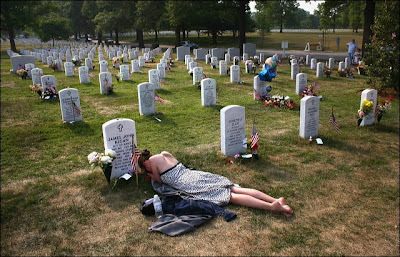 Do not comfort yourself by assigning our fallen soldiers the label of fearless. Their hearts pounded so hard that it made their shirt buttons rattle each time they climbed out of a foxhole, or into an airplane, or heard the ship’s engines engage and felt the change of course in the tidal yaw. Our fallen were not without fear: instead of using it as reason to let someone else stand in harm’s way, they used that fear to propel themselves onto something less common: bravery. While the causes of war fall under dispute and the actions of world leaders never fail to disappointingly repeat history, the sacrifices made by soldiers and their families cannot be overstated. I reject the cloying news coverage of double-dealing politicians laying wreaths and anchors phoning in their condolences. Those who have died defending our outlandishly optimistic and risky experimental country and its allies deserve a more sincere and lasting legacy. It begins with living the best and most appreciative life you can muster every day, because any of them would gladly change places with you if this life has become too tiresome or dreary in its ordinary-ness. It continues with things like Memorial Day barbeques with family and friends, because in the end, after the dust has settled, that’s what was fought for. But you know what would be really nice? To take time out of your day to show some respect. This observance does not make you pro-war. The biggest pacifist in the world is the soldier who has seen combat. None of this is easy. And because of that, Memorial Day has a lot of meaning to me. Touching photo: John Moore at Getty Images. Thanks guys. I appreciate the support! Thanks you, Emily. The underlying theme of every holiday is really about gratitude, isn't it? Our own hearts are better for having shared this one with you. "Any mans' death diminishes me,for I am involved in mankind…."